Lined chiton, Tonicella lineata. The eight plates on this chiton's shell are easy to see. Chitons are primitive marine molluscs in the class Polyplacophora (formerly the class Amphineura). There are 900 to 1,000 living species of chitons. Their size ranges from 0.5 to 30 cm in length; most are quite small. All the living species are in the subclass Neoloricata, and so may be called 'loricates'. Popular names are sea cradles or coat-of-mail shells. They have a single shell that sticks to rocks, like a limpet. The shell is made of hard plates that fit tightly together, overlapping one another. The shell plates are surrounded by a structure known as a 'girdle'. Polyplacophora means "many plates". The plates refer to the shell, which is made of aragonite, a calcium carbonate mineral. The shell is quite flexible, and the chiton can even roll into a ball. The chiton has eight plates, and underneath the plates is a muscular foot that moves the chiton over rocks and other structures, both in and out of the water. It also has a tongue-shaped structure called the radula, which has many rows of 17 teeth each. Some use it to scrape algae off rocks, while others are carnivorous, catching tiny zooplankton and other small animals that live in shallow water. Chitons can be less than an inch long, or up to a foot long. They come in many different colors: black, red, pink, and even blue. The shell might be shiny or dull, or smooth, hairy, scaly, or spiny depending on the species. The underside of the gumboot chiton, Cryptochiton stelleri, showing the foot in the center, surrounded by the mantle. The mouth can be seen on the left of the foot. It is very hard to see the underside of a chiton because they cling so tightly to rocks and can also curl into a ball. If a chiton was picked up and turned over, there would be no eyes, legs, or arms. There would only be a wide foot with a radula that it uses for scraping surfaces. Its mantle is right under the shell, with the lowest part of the mantle coming out under the edge of the shell to help its foot grip the surfaces on which it clings or slides along. The part of the mantle which sticks out is called the girdle. Like the moon snail, the girdle may extend out over the bottom part of the shell covering the bottom half of the chiton. Most chitons are nocturnal, so they feed at night, and hide under rocks during the day. Their main habitat is the intertidal zone. They live on hard surfaces, such as on or under rocks, or in rock crevices. Some species live quite high in the intertidal zone and are exposed to the air and light for long periods. Others live subtidally. A few species live in deep water, as deep as 6,000 m (about 20,000 ft). 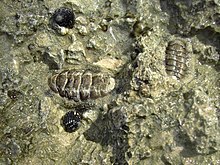 Chitons have a relatively good fossil record, stretching back 400 million years to the Devonian. Before this, some organisms have been interpreted (tentatively) as stem-group polyplacophora; the record of polyplacophora stretches back to the Upper Cambrian. Kimberella and Wiwaxia of the Precambrian and Cambrian may be related to ancestral polyplacophora. Matthevia is a late Cambrian polyplacophoran preserved as individual pointed valves, and sometimes considered to be a chiton. The polyplacophorans may have formed when an aberrant monoplacophoran was born with multiple centres of calcification, rather than the usual one. Selection acted on the resultant conical shells to form them to overlap into protective armour. Their original cones are homologous with the tips of the plates of modern chitons. Wikispecies has information on: Polyplacophora. ↑ Barnes, Robert D. 1982. Invertebrate Zoology. Philadelphia PA: Holt-Saunders. 381–389. ISBN 0-03-056747-5. ↑ Sigwart; Sutton M.D. 2007. Deep molluscan phylogeny: synthesis of palaeontological and neontological data. Proceedings of the Royal Society B: Biological sciences 274: 2413–2419. doi:10.1098/rspb.2007.0701. PMID 17652065. For a summary, see The Mollusca. University of California Museum of Paleontology. http://www.ucmp.berkeley.edu/taxa/inverts/mollusca/mollusca.php.